The article provides facts and information about Trail of Tears. Facts and information about the tragic journey of the Cherokee tribe and other members of the Five Civilised Tribes called the "Trail of Tears". Interesting facts and information about the Trail of Tears and the Cherokee Tribe. The history of the Trail of Tears with key dates and map. Learn about the history of the Cherokee tribe and how they were eventually removed from their tribal homeland - culminating in the tragic history of the 1000 mile march called the Trail of Tears. What was the Trail of Tears? Definition: The Trail of Tears was the name the Cherokee used to describe to the 1000 mile route, or trail, that they were forced to travel, from their homelands in the Southeastern United States to reservations in present day Oklahoma, as a result of the 1830 Indian Removal Act. The Cherokee were members of the Five Civilised Tribes who lived in the Southeastern United States until the 1820s. 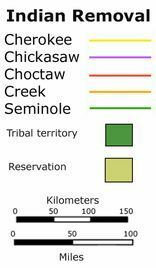 The Five Civilized Tribes consisted of the Cherokee, Creek, Choctaw, Seminole and Chickasaw. The Cherokee tribe referred to themselves as the "Principal People" as they were the largest tribe living in mountain areas of North and South Carolina, Alabama, Georgia and Tennessee. Where is the Trail of Tears? The Trail of Tears Map shows just how far the Five Civilised Tribes had to travel. The term 'Trail of Tears' was first used by the Choctaw tribe in 1832. Of the 16,000 Choctaw Indians who walked the Trail of Tear between 5000 and 6,000 Choctaws died on the route. Despite association of the term with the Cherokee Removal, the Choctaws lost the most people on the Trail of Tears and the highest percentage of people during the Indian Removals. It is helpful to understand the different facts about the lifestyle and history of the Cherokee to fully appreciated the fate of these people who were forcibly moved from their homes and lands to strange territory 1000 miles away via the Trail of Tears. Understanding the lifestyle and culture of the Cherokee will dispel any pre-conceived ideas that this tribe could in any way be classed as 'savages'. A word often applied to many Native American Indian Tribes. Their integration with the life style of the Europeans had included inter-racial marriages between the Cherokee and the Europeans. Andrew Jackson (1767-1845) was the 7th president of the United States who was elected president in 1828 and became instrumental in the events leading up to the Trail of Tears. The most controversial aspect of the presidency of Andrew Jackson was his policy regarding Native American Indians, which involved the ethnic cleansing of several Indian tribes. At the time of the inauguration of Andrew Jackson there were many white settlers, particularly those who had experienced frontier wars, who advocated the total extermination of the "savages." Andrew Jackson signed the Indian Removal Act into law in 1830 which authorized the President to negotiate treaties to buy tribal lands in the east in exchange for lands further west, which ultimately led to the Trail of Tears. The Indian Removal Act was the first major legislation that reversed the U.S. policy of respecting the rights of American Indians - it led to the Trail of Tears. The Indian Removal Act of 1830, signed by Andrew Jackson, started the removal of the Five Civilised tribes, including the Cherokee, on the Trail of Tears from their homelands in the Deep South to reservations in Oklahoma. A limited number of Cherokee in North Carolina remained in their homelands. Following the signing of the 1830 Indian Removal Act by Andrew Jackson a group of Cherokees known as the Treaty Party began negotiating a treaty with the federal government. This small group led by Major Ridge and his sons and his brother signed a treaty at New Echota in Georgia during 1835. 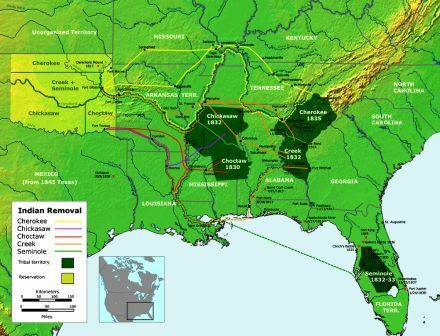 The Treaty of New Echota ceded all Cherokee land to the United States for $5.6 million. In return the entire Cherokee Nation was expected to move west to an Indian reservation - the journey would the infamous Trail of Tears. The Treaty of New Echota was signed by a minority Cherokee political group and not approved by the Cherokee National Council. Many of the Cherokee condemned the treaty and resisted removal but 17,000 Cherokees were eventually forced off their land in 1838 and had to undertake the long journey across the Trail of Tears. On 06 April 1838 President Martin Van Buren ordered General Winfield Scott to take charge of the removal of the Indians to start their journey on the Trail of Tears. The 7,000 troops of General Winfield Scott moved into Cherokee country in May 1838, and began disarming the Cherokee and forcing them to leave their homes to embark the long march of the Trail of Tears. Women and children were dragged from their homes with only the clothing they were wearing. The U.S. soldiers forbade them to retrieve extra clothing, food or blankets. Their homes were all burnt and their property stolen. Farms that had belonged to the Cherokees for generations were won by white settlers in a lottery. The people were moved to stockades at the Indian Agency near Charleston, Tennessee. The people of the Cherokee were organized into separate groups of about 1,000 people in preparation for their journey which became known as the Trail of Tears. The help that the Cherokee people had on the journey and route covering the 1000 miles of the Trail of Tears consisted of 600 wagons and carts, 5,000 horses and just over 100 oxen. They had scant clothing, some had no moccasins, and they only had light blankets. The removal of the Cherokee began in November of 1838 with the prospect of facing winter travel to cover the Trail of Tears. The story of Trail of Tears is both appalling and sad. Forced from their home men, women and children were forced to walk over 1000 miles facing the most terrible trials and tribulations. To travel across the Trail of Tears took six months. The story and tragedy of the Trail of Tears was made even worse by the hazards that the people encountered on the journey of misery, sickness, and death. To walk the Trail of Tears it took SIX long months. One person out of every four died on the forced march across the Trail of Tears. The type of transport varied considerably along the Trail of Tears. The wealthy members of the Five Civilised Tribes travelled ahead of the huge groups. They were the lucky ones and travelled in warmer weather in carriages and covered wagons across the Trail of Tears. The vast majority suffered through lack of provisions and comfort. However, not everyone walked the whole of the Trail of Tears route. Large numbers of the Choctaw and Creek tribes were taken as close as possible to the Indian Territory by steamboats, then they had to walk the rest of the way. Large numbers of Cherokees were transported by barges and flatboats to Arkansas, then they had to walk the rest of the way. The majority of Cherokees were provided wagons but there was not enough space for everyone so these people had no alternative but to walk. Many of the horses died on the journey so even more people were forced to walk the Trail of Tears. which has been about three weeks. It is unknown when we shall cross the river...."
There was no cure for these diseases. There were no medicines or doctors on the Trail of Tears. The young, weak, elderly and the sick were the first to die. The Trail of Tears was followed by grieving, bereaved families and became littered with unmarked graves that were far away from their traditional homelands. Nearly 4000 Cherokees died on the Trail of Tears from malnutrition, exposure, and disease. 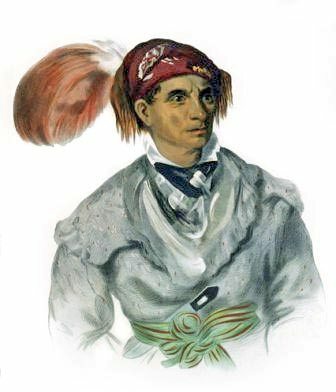 The Cherokee refer to the Trail of Tears as 'Nunna daul Isunyi' which translates to “The Trail Where They Cried”. The end of the American Civil War (1861–1865) saw the demise of the Cherokee tribe. The treaties of the tribes who had supported the Confederacy were put aside. Their lands were restricted to Eastern Oklahoma and their black slaves were freed. The federal policy of detribalization followed resulting in the loss of authority of the governmental functions of the Five Civilized Tribes including the Cherokee. At the end of the Trail of Tears was the promise of a tribal land but this promise would soon be broken. The U.S. government began a policy of breaking up tribal lands and allotting the lands to individuals. In 1893, President Grover Cleveland appointed a commission, chaired by Senator Henry L. Dawes, to negotiate land with the Cherokee, Creek, Choctaw, Chickasaw and Seminole tribes. An Act of Congress authorized the Commission headed by Henry L. Dawes to determine who was eligible for tribal membership and land allotment. The result of this commission eventually produced what is called, the Dawes Rolls or the Final Rolls of the Five Civilized Tribes. The Dawes Rolls, or the Final Rolls of the Five Civilized Tribes, entitled an allotment of land to tribe members, in return for abolishing their tribal governments and recognizing Federal laws. The Trail of Tears. Discover the vast selection of pictures and videos of Native Indians. The pictures show the clothing, weapons and decorations that can be used as a really useful educational resource for kids and children of all ages. Our series of videos enable fast access to the images, pics, paintings and pictures together with information and many facts. We hope that this article on Trail of Tears will assist in your studies or homework and that you will enjoy watching the videos featuring many pictures of the Native Indians.